Rance Cardinal at the Saskatchewan border. 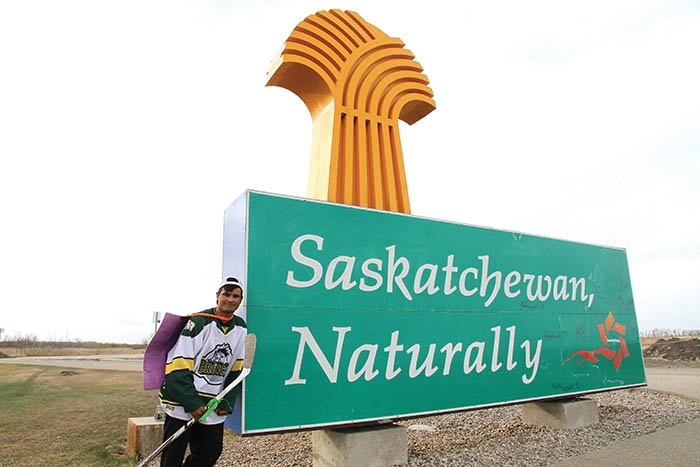 Rance Cardinal arrived in Saskatchewan Thursday on his walk from northwest Ontario to Humboldt in honor of the Humboldt Broncos. “It’s not every day I’m able to go to a Jets game. It’s maybe once a year. I had my sign saying ‘I just want to be on TV. Minutes before we saw the breaking news on the TV,” he says. Rance said it felt great to make it to Saskatchewan on Thursday evening. “It’s a big ape off my back. To get here is just awesome. I get to start my healing process a little more in depth. Each day I’m in Saskatchewan I’ll be thinking of one of the people who died on that bus. I can’t tell you how much I feel. “The support is just unbelievable. Being told you’re an inspiration. Being told you’re a hero, being told you’re bringing Canada together. It’s something I would never ever think I would hear. “I started off the day with the junior high kids at Virden and that was great way to start the day. Rance lost a teammate to a car accident, and knows how it feels to lose someone close. He also lost his younger brother to an illness in 2013. “This is a time of healing, like my late brother would always say, we’ll always bounce back. I want to send that message,” he says. “We’ll bounce back. This tragedy should say to everybody around the world our life is short our life is precious so live every moment like it’s your last. “What I’ve learned about myself is you just have to put your mind to whatever you’re doing. You have to put your heart into it. I love hockey just as much as these boys did. It makes me sad, it hurts me to think about them. They were just young kids, young men.